We knew it was coming. 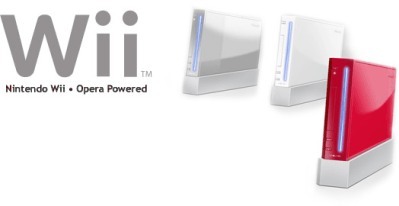 As of this morning, all you lucky Wii owners will be able to connect to the Internet using your Wii’s Opera-based browser. The final version of the browser will be available in March and you’ll have till June to download it, otherwise you’ll have to pony up 500 points for it. But starting today, you can enjoy all the surfing you want. And yes, that means you can now play your favorite YouTube videos on the big screen. So to recap, Opera is or will be available for Windows, Linux, Mac, and other operating systems including BeOS and FreeBSD. It runs on mobile phones and Windows Mobile PDAs. And now it will run on the OLPC (which odds are you’ll never get your hands on), and the Nintendo Wii (which you’ll probably have a hard time getting your hands on until after the holidays). Nintendo plans to make available a customized version of the Opera browser for its Wii console on Friday, the company said Tuesday. Users will be able to download a trial version of the software at that time, which would activate the “Internet Channel” on the Wii menu. The final version is due out in March 2007. Downloads until June of next year will be free, and 500 Wii points afterwards. The two companies first announced the partnership in May of this year. “Our software brings the power and reach of the Internet to the hottest video game system available,” Opera devices executive vice president Scott Hedrick said. “Wii’s unique interface adds a new dimension to our browser, making it a useful tool that the whole family will enjoy operating with ease.” The browser would be standards based, and come with built-in support for Adobe Flash.